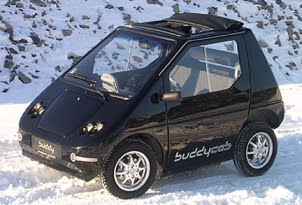 Via a blog called Danny’s Contentment we learn that another hopeful electric car is heading for UK streets: the Kewet Buddy. “It’s a nice little car and better than I expected it to be,” says Danny, before reporting that the little wedge-shaped runabout will likely cost £11,000. Which is quite a lot. And it hails from Norway. And it looks a little bit like a Bond Bug with an extra wheel. Designed to seat three abreast the Buddy also has luggage-carrying capacity “designed around two cases of beer,” according to Kewet. That’s the Norwegians for you. We hope Ken Livingstone is paying attention – use of bus lanes sounds like a great benefit that would contribute greatly to Ken’s plans for reducing pollution in London. Kewet claims a top speed of 80-90km/h (50-56mph) depending on battery technology - maintenance-free lead-acid batteries are offered and lithium-ion are an option for greater storage capacity. Claimed range is 50-100km (31-62 miles) for the lead lumps, or 100-150km (62-93 miles) on lithium power. We admire Kewet’s optimism in offering a towing hook among the optional extras.